This will be an extensive tutorial on how to work with groundcover, as well as how to generate groundcover. This is mainly an extension of my previous Northern Gold Coast Grass Tutorial, which you can still find further down in this post. First things first, you are going to need Yacoby's Mesh Generator. The latest version should be available for download here. use the Settings Editor (next to Output file when you run the generator), or just open the bad boy and do it manually (it's what I do). Keep in mind the settings editor is untested, so it might not work properly after all. Let's go through all the options we have here. Feel free to use the settings editor to change these lines. I'll just go through the ini itself. 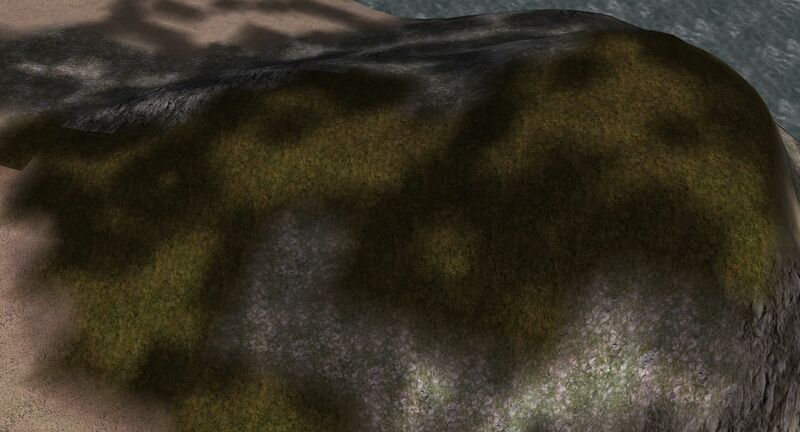 - Basically this is the texture that grass will be generated on top of. For some reason no texture other than [i]GL_grass_03[/i] has ever worked for me. It doesn't really matter what texture you use... I'll base this tutorial on the fact that I am using this texture. But even if you could make it work with custom textures from [i]PC_data[/i], it's incredibly useful to be able to generate grass to certain areas that you can apply [i]GL_Grass_03[/i]/whatever on instead of generating grass all over the damn place. There's several more options to restrict grass generation to a certain cell/region/certain cells. - Generates clumps of grass. Pretty worthless in my opinion. - The minimum height a mesh can be generated on. Obviously you might want to leave this at 0. Grass doesn't grow underwater. - The higher/lower the number, the more grass. You can achieve the same effect by lowering/increasing the gap between individual meshes, so I always leave it on these numbers. Apparently it doesn't matter if the value is unsigned or not. - This is the number of ingame units that *should* lie between the banned ground texture and the spots you generate grass on. This is quite a broken mechanic though. - In theory these should automatically set the generated objects' CS IDs to what you put in here. For some reason it only spits out error messages for me. - Only relevant when generating containers. That should be all regarding the ini. The settings editor should be pretty straightforward, though I've never used it. Now let's head over to the actual Grass.exe. - Captain Obvious: This is the location of your [i]Grass.ini[/i] that you have edited accordingly. - This is just so that the game knows where to find the meshes folder and where to put the output file. - The program will generate grass only for the plugin or master files listed here. 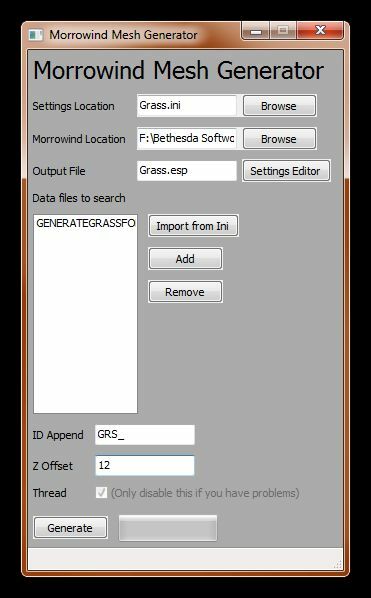 Since I am using [i]GL_grass_03[/i], I need to remove Morrowind.esm via the "remove" button before I generate anything. Don't wanna have grass all over the actual grazelands. It's not good having dirty files. - Pretty self-explanatory. This will put a prefix in front of your object ID in the [i]CS[/i]. 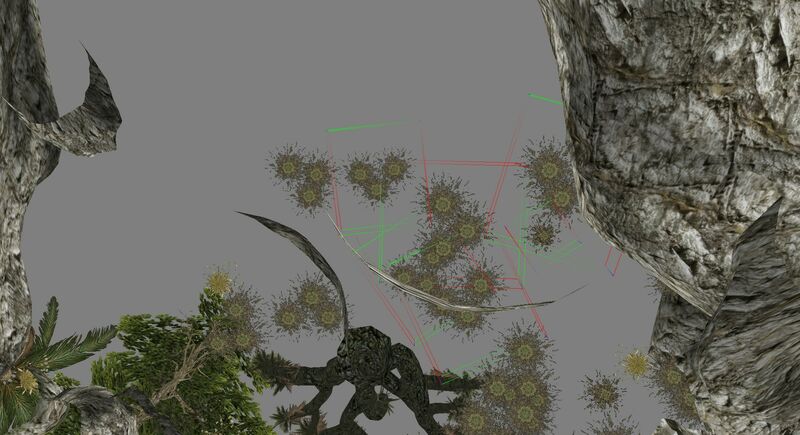 I usually leave it at [i]"GRS_"[/i] because I replace new grass meshes with the [i]PC_[/i] ones after merging, anyway. - Decides upon how much grass will be sunk into the ground. SGM claims that this has no effect. See for yourself. - C'mon, are you really reading this? As if this needed any kind of explanation. Now, there is just about two ways to work with the groundcover. I will talk about each of these in detail in the next parts of this tutorial. This is probably the most common way of working with groundcover, and what you should be doing in the Southern Gold Coast. Mostly I would do this when having a lot of "solid" objects like rocks scattered around a cell, you should generate grass after placing all the actual statics. Make sure you backup your file now so that you won't have to apply textures twice. Waste of delicious time. Now, load the backup file and apply GL_Grass_03 to all areas where you'll want to have grass. 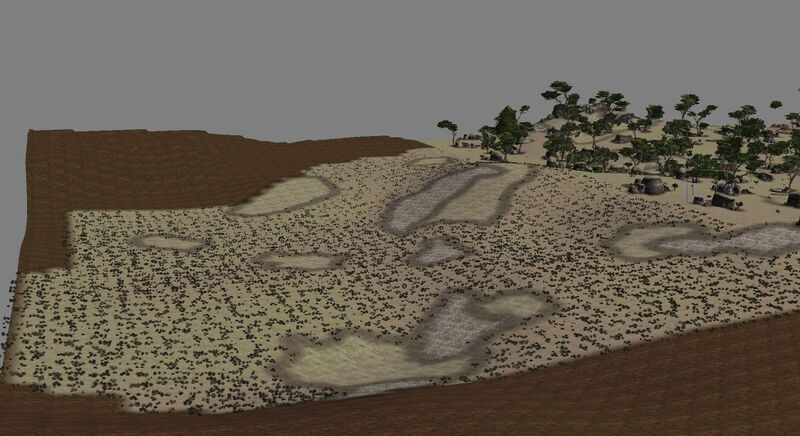 In this case, it would be restricted to areas with PC_tx_GL_grass applied to them. Got that? Now you should have a [whatever].esp containing the groundcover in your Data Files directory. If it's something like 1 KB you shouldn't even bother loading it up, it hasn't worked. This could be because you had a wrong texture, wrong file paths or because your ini had typos or invalid values. It will look like this now: Keep in mind you should load the grass file with your first file that does NOT have the GLified spots in it. Don't forget to delete the dependencies on any esms via Enchanted Editor. The real fun begins now! You thought this was over, didn't ya? Think again! We will need to fix any placement errors that the generator has produced. Unfortunately, the program is not able to determine whether grass is being placed into other statics or not. Furthermore, it happens ever so often that grass ends up in spots that it's not supposed to end up in. Decide for yourself which method you like best for this. I can say that this is a very time-consuming part, no matter what. It pays out in the end though. Before you do anything, though... It is not needed to combine the Grass.esp and the main file into one esp to work on the grass. It's actually a lot easier and safer to just load up both, but set the Grass.esp as the active file. You will have both loaded, but only changes made to the groundcover file will be saved. In this shot, you see a couple grass meshes stuck on the road. Kill those with fire unless you wish to have an overgrown road for aesthetical reasons. There are several ways I usually go on about deleting grass underneath or half in, half out of rocks. Firstly, you can turn the camera upside down, so that you'll be looking at the rocks from underneath. 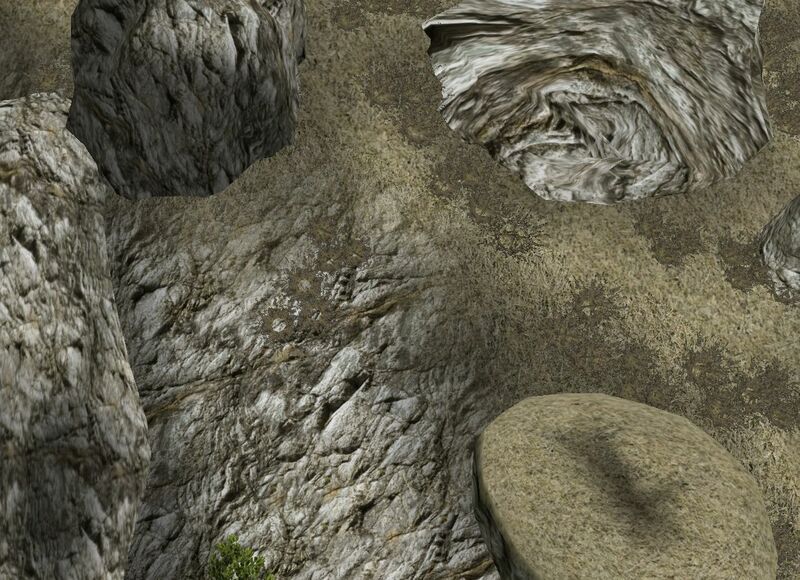 Now you can very clearly see any grass meshes camping beneath rock meshes. Simply select them and delete. A more convenient way is to leave the camera as is and just make a whole selection of the rock and all the grass beneath it, then deselect the rock. 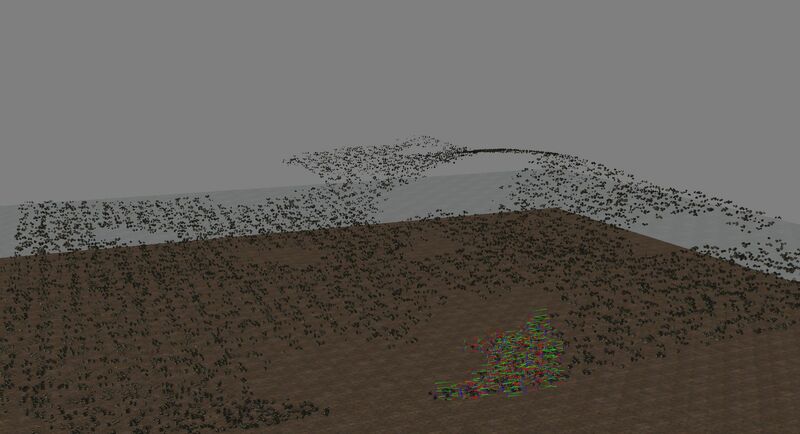 Now your selection will contain just the grass meshes that are bleeding into the rock or that have been generated underneath it. Well, you do that until you think it's fine. Yes, SGM, this might not be necessary. I am a perfectionist though. 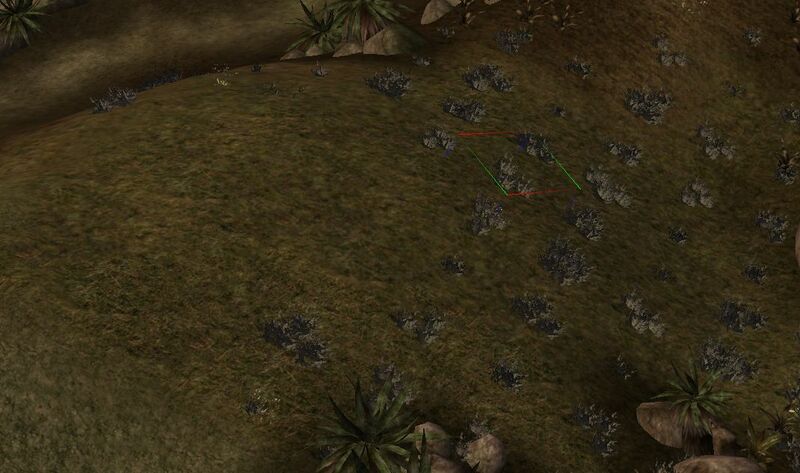 At least any bleeding grass should be moved out of the rock. You can simply handpick them and drag them around, make small adjustments to the rotation if necessary. In areas that are supposed to have a lot of groundcover and that don't really have a lot of rocks overall, I would highly recommend generating the grass before placing statics. Let's just assume for now that you have a certain patch of land that you want to have groundcover on. Load your file and look straight at it until your eyes burn. Now you're doing it right! 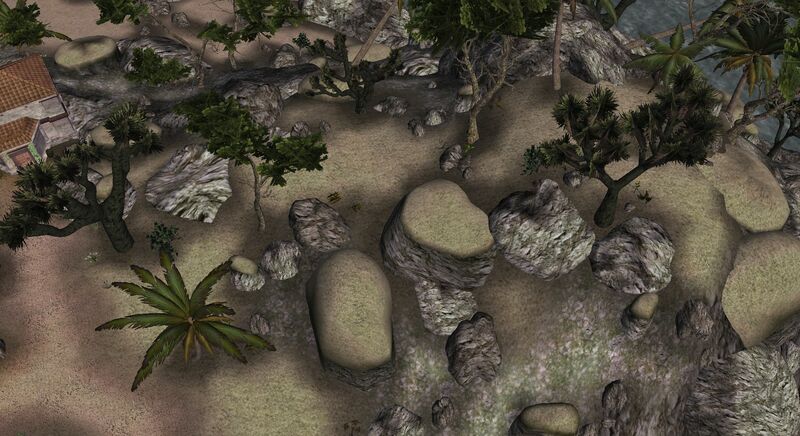 Before you generate anything, make sure all of your terrain is perfectly free of any jagged or rough terrain. 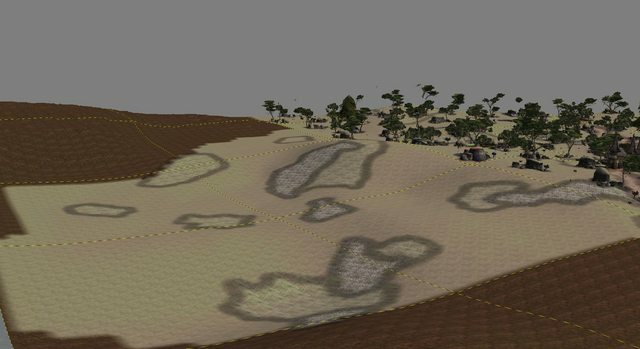 You must keep in mind that, with this method, you will not be able to change anything about your terrain layout once the grass has been generated. Smooth away! 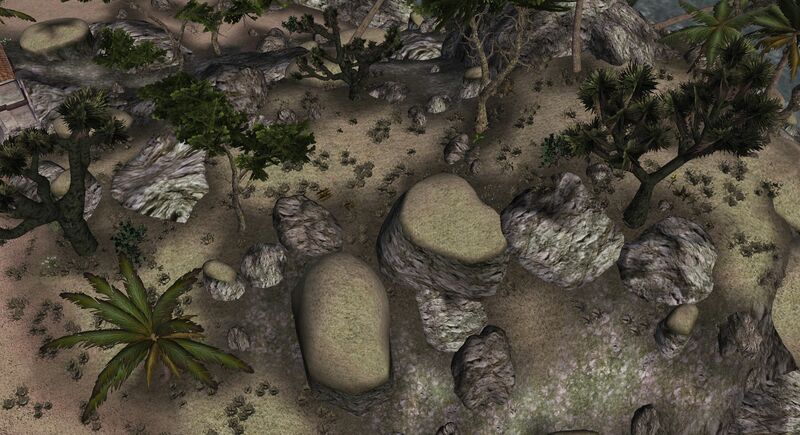 Given how generally flat the terrain in this region is, any jagged terrain should be fairly easily detectable. Make sure you apply ground textures already as well, as you want to know which areas should have groundcover and which should not. Naturally, if you wish to generate grass next to your roads, sink them first! Once you're done, save your file and close the CS. Now you want to make a copy of your file that you should give an easily recognizable name, such as GENERATEGRASSFORTHISMUM.esp . Now load that as an active file. What you will be doing (again) now is paint the ground that has the GC_grass texture on it with the texture GL_Grass_03. Only apply this texture to areas that should have grass! After staring at your screen some more and after the occasional bits of noticing that the texture looks quite cool together with all the GC stuff, you can now move on to generating your grass. Now click on the 'Generate' button and watch the bar fill up! But because that looks like rotten scamp skin, we are going to load it together with our original file, not the one we used for generating the grass. Lookin' good, eh? Now click on File -> Combine Loaded Plugins. Save that as a new file (for instance, NEWFILE.esp). It will automatically be set as your active file. 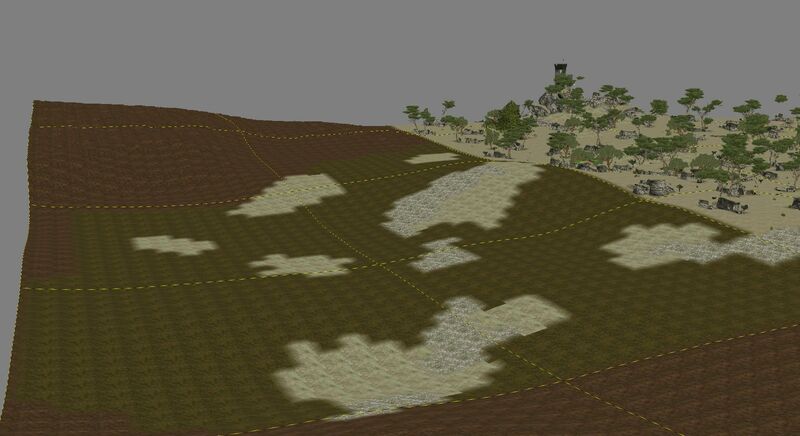 It's probably best if you do not replace the GRS_ objects with anything yet, it'll be done when it gets merged with the existing Gold Coast areas so that we have one universal grass object for each of the 4 meshes. There you go! You're ready to work on the area. How do I split up the grass and the main file? I shall show you. Make a copy of your NEWFILE.esp . 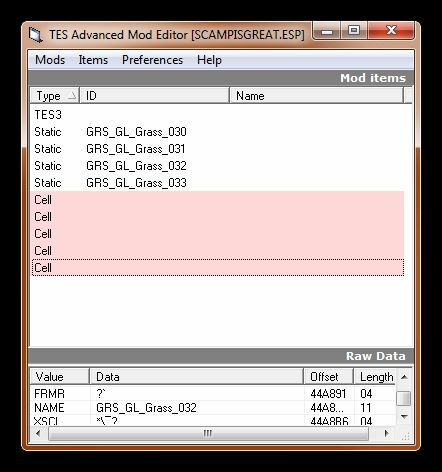 You should name the other file SCAMPISGREAT.esp in order for this to work properly. Open NEWFILE.esp in TESAME. 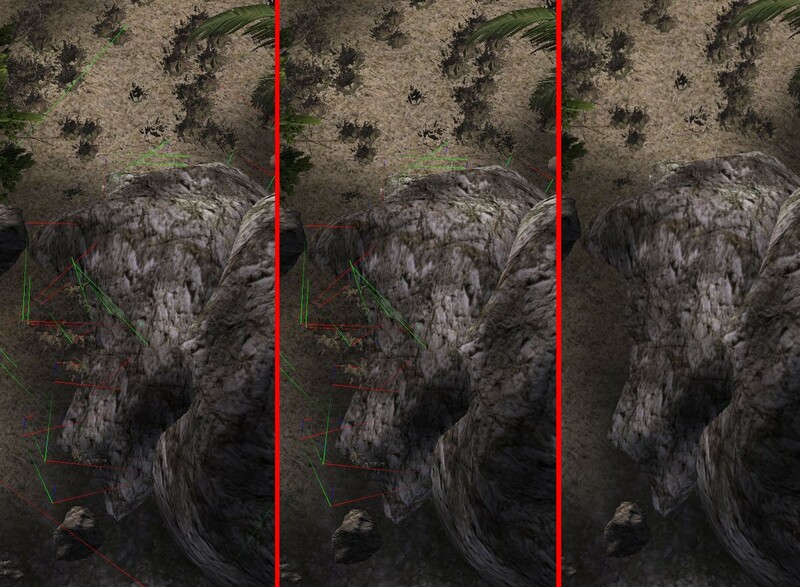 Look for the four entries of the grass objects as shown in this picture, and delete them. Now save that file and open it in the CS as your active file. You will receive a couple of warnings that the grass is missing. Save the file once it has loaded. You will not receive any further error messages. This is your file without grass. The process of creating a file that has only the grass in it is a bit more complicated. In theory, you just delete everything except the grass in TESAME - and the cells it is in. In practice, that can get quite a bit silly. 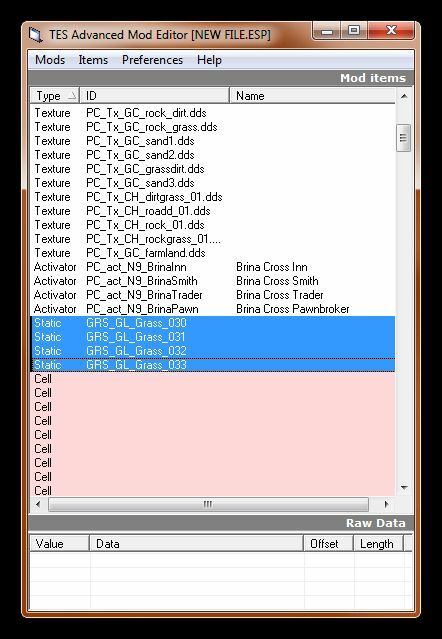 If your file contains only the cells you have generated grass for, just remove the landscape entries and you're done. In my case, these should be the only cells with objects in them that don't have a region applied to them (You can see the objects located in a cell by double clicking on it in the Advanced Mod Editor). Easy as well. 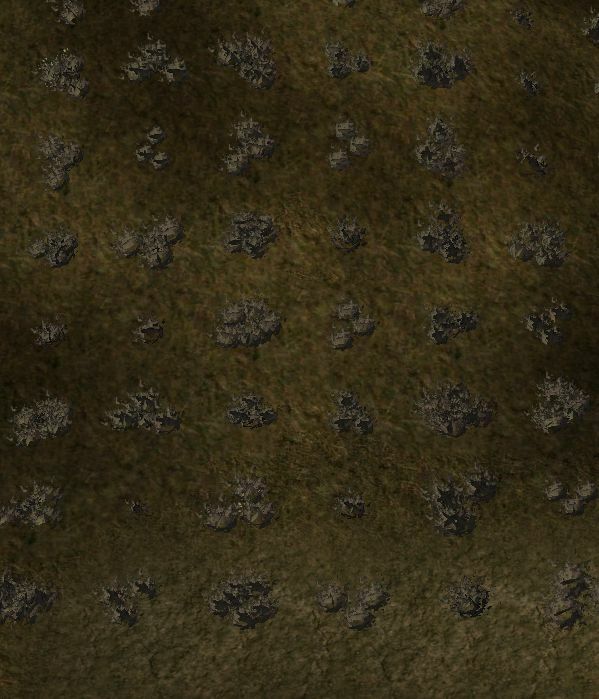 If it's more complicated than that, just name your grass cells to something you will easily recognize, such as FARGOTH. Keep only those and the four grass pieces. No landscape entries. There you go once more! This is your file that has only the grass. Again, don't forget to remove the .esm dependencies of your grass file with the Enchanted Editor. You have now successfully split the groundcover from your main file! Last edited by Scamp on Mon Jan 05, 2015 5:27 pm, edited 1 time in total. This is quite possibly the most awesome grass tutorial I have ever seen. Woah, this is one awesome grass tutorial!